I’m a huge fan of Samsung Galaxy phones. My family uses various Samsung Galaxy phones and tablets, and I recommend them to friends and coworkers. However, new Samsung Galaxy phones off contract can set you back several hundred dollars, and you might not want to sign a two-year agreement in order to get a discounted Samsung Galaxy phone. Fortunately, you can buy a certified pre-owned smartphone in good or excellent condition from Gazelle. Gazelle’s certified pre-owned devices go through a more than 30-point in-depth inspection process. Highly trained techs find and fix any issues with the phones before they’re offered for sale. Gazelle’s quality checks include making sure all of the following work: volume buttons, audio from speaker, audio from headset jack, front and rear cameras, flash, camcorder, microphone, battery charging, phone calls, home button, voice commands, touchscreen and backlight. Gazelle also makes sure the device wasn’t stolen and is cleared for mobile activation. Each phone comes with a 30-day return policy and no contracts or commitments. You can select a Samsung Galaxy SIII, S4 or S5 phone and choose from among phones compatible with AT&T Wireless, Sprint, T-Mobile or Verizon Wireless. Some Samsung Galaxy certified pre-owned phones cost less than $150, and you can save even more with this exclusive Gazelle coupon code link. 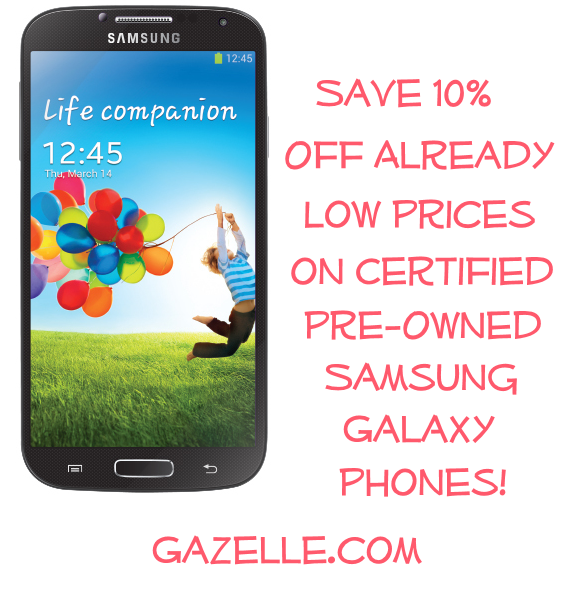 Click on this Gazelle link to receive 10% off any Galaxy phone through June 21. Founded in 2006, Gazelle is the nation’s leading consumer electronics trade-in site. Gazelle pays cash for used devices and has thus far paid out more than $200 million for gadgets that people no longer needed. Gazelle has handled more than 2 million devices over the years. Not only are Gazelle’s certified pre-owned Galaxy phones a great deal for you, but they make great Father’s Day gifts as well.